1. When in season, which type of vegetable does one associate with muskat, spaghetti and butter nut? 2. The world's shortest war in history lasted just 38 minutes. It was fought in 1896 between Zanzibar and which European nation? 4: The Air France Concorde that crashed in Paris narrowly missed another plane on which a famous person was travelling. Who was travelling on the other plane? 5. What is the biggest export of North Korea? 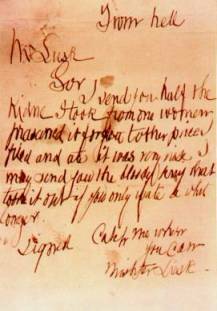 6. Who infamously addressed one of his letters to the London police with the words "From Hell" ? 7. If you PORTAGE a canoe, what are you doing? 8. What type of clock did Harrison invent? 9. The following lyrics come from which famous song? 'And the operator says, "forty cents more for the next three minutes". 10. What is the more common word for IPSATION?